With one of the largest political programs in their history, Washington Conservation Voters, the state’s political voice for the environment, had a decisive impact on races throughout the state. WCV was one of the top two largest contributors supporting Senator-elect Manka Dhingra in the 45th District State Senate Special Election. With a win in this East King County seat, Washington state now has a pro-environmental Governor and majorities in the House and Senate, creating a block of pro-environmental states along the entire West Coast. The stark contrasts between the two candidates on environmental issues was a key factor for voters in the district. For several years, key legislators in Washington’s State Senate backed by thousands in oil industry contributions, have stymied vital environmental protections. Washington Conservation Voters also helped lead the Our Votes Count coalition. Our Votes Counts knocked on doors in legislative districts 45, 30, and 28 to engage infrequent voters who generally support environmental candidates, but don’t consistently vote. These voters are often younger voters, people of color, and single women. This is a multi-year strategy to boost voter turnout in swing legislative districts by widening the base of environmental voters. The 2017 race for Vancouver Port Commissioner (the most expensive in the port’s history) was largely seen as a referendum on the proposed Tesoro oil-by-rail terminal. If built, it would be the largest oil terminal of its kind in North America. A large coalition of fire fighters, longshoreman, business owners, and community groups have worked for over five years to stop this proposal from moving forward. As part of the community, WCV and hundreds of local volunteers went toe to toe with one of the largest oil companies in the world. 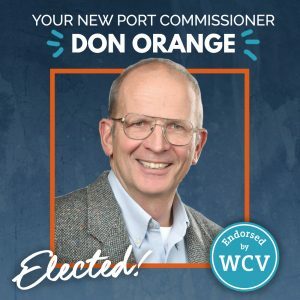 With current Port Commissioner Eric LaBrant (elected in 2015 with the help of WCV), and tonight’s win for Commissioner-elect Don Orange, the three-person Commission now has a mandate to terminate the lease for the oil terminal.